Replace that unhealthy sugar-filled soft-drink (or chemical-filled diet drink) with a unique effervescent drink that gives you the boost you need for body and mind, whenever you feel like your engine is running on empty. Ideal for the mid-afternoon energy slump. Contains less than 10 calories per sachet. No saccharine, aspartame or cyclamate. Provides an instant energy boost in a pocket sized sachet. Available in 2 flavours - Lemon-Lime Blast & Ignite-Me Orange. Just empty one sachet in 1 cup of cool water and let dissolve. Enjoy 1-2 servings per day. A natural stimulant. 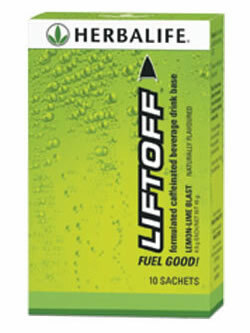 In LiftOff the caffeine is sourced from Guarana. A South American native shrub used for centuries by the Amazon Indians for its uplifting and refreshing qualities. An amino acid that serves many different functions in the body. In certain situations Taurine can provide a boost as the body is not capable of making enough Taurine to meet its needs. Breaks down glucose to release energy. Assists digestion and aids in the function of the nervous system. A water soluble vitamin which is a vital component of the human diet. Assists in reducing cholesterol levels and in regulating metabolism and cell repair.